6If anything, this volume's premise--that the business of Web design is one of constant change-has only proven truer over time. So much so, in fact, that the 12-month design cycles cited in the last edition have shrunk to 6 or even 3 months today. Which is why, more than ever, you need a smart, practical guide that demonstrates how to plan, budget, organize, and manage your Web redesign - or even you initial design - projects from conceptualization to launch. 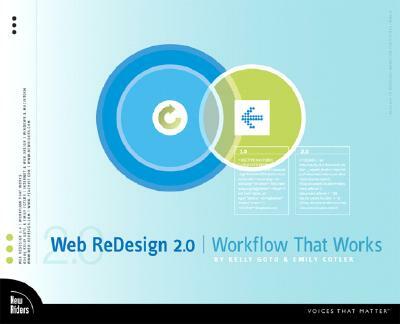 This volume delivers In these pages Web designer extraordinaire Kelly Goto and coauthor Emily Cotler have distilled their real-world experience into a sound approach to Web redesign workflow that is as much about business priorities as it is about good design. By focusing on where these priorities intersect, Kelly and Emily get straight to the heart of the matter. Each chapter includes a case study that illustrates a key step in the process, and you'll find a plethora of forms, checklists, and worksheets that help you put knowledge into action.This is an AIGA Design Press book published under Peachpit's New Riders imprint in partnership with AIGA.